Running Windows 7 (SP1) 64, and I can't get it to install. Downloaded twice (to check corrupted .exe), as soon as I run I end up with 3 'TheBrain 9.0.72.0 Installer.exe *32' processes (all about 112 KB) but no action after 10 mins, can't kill the processes (except via reboot). Running as admin, with Avast 10.4 with OL closed (but TB 8 was also running). With TheBrain 9, there is no need to close Outlook. It also does not matter if TheBrain 8 is running as 9 will install to a separate location. Try disabling Avast before you run the installer. 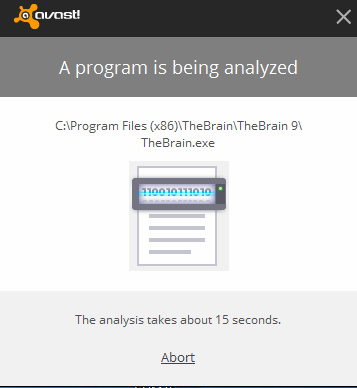 Good call, never had a problem with a Brain install and Avast before?? Updates to Avast 11.1 same problem, disabled and it worked so you were right! But Avast is not very happy, never seen a deep scan on the messages below before, but after 2 shutdowns / opens Brain 0 seems to be working, thanks! Glad to hear that you are up and running! Enjoy your Brain!